POP UP CYCLE Art Installation – You Contribute! You contribute to our Pop-Up Upcycled Art Installation! 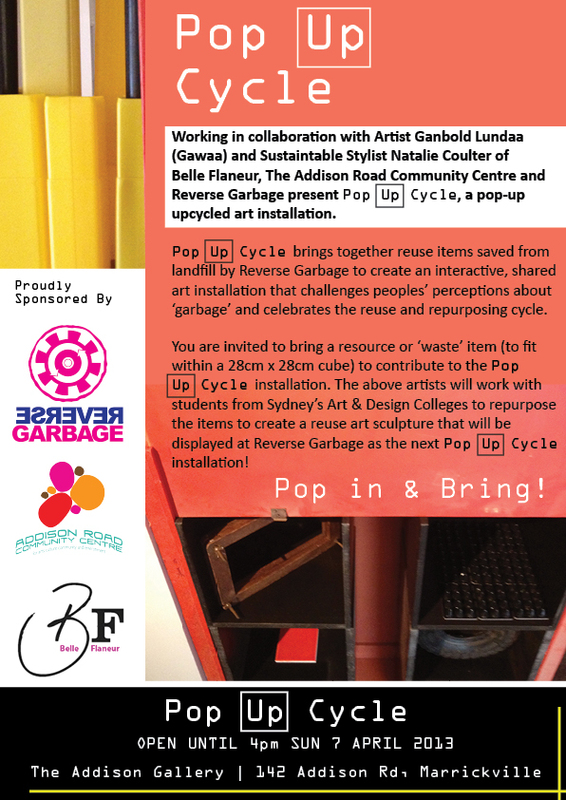 Working in collaboration with Artist Ganbold Lundaa (Gawaa) and Sustainable Stylist Natalie Coulter, founder of Belle Flaneur, The Addison Road Community Centre and Reverse Garbage present Pop Up Cycle, a pop-up upcycled art installation. Open now until Sunday 7 April 2013, POP UP CYCLE brings together reuse items saved from landfill by Reverse Garbage to create an interactive, shared art installation that challenges peoples’ perceptions about ‘garbage’ and celebrates the reuse and repurposing cycle. You’re invited to bring a resource or ‘waste’ item (to fit within a 28cm x 28cm cube) to contribute to the Pop Up Cycle installation. 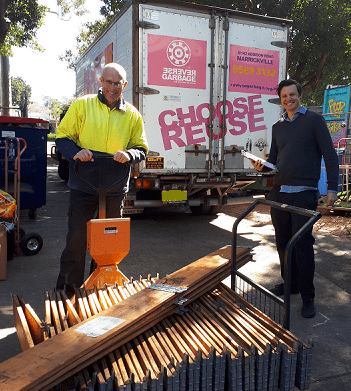 The above artists will work with students from Sydney’s Art & Design Colleges to repurpose the items to create a reuse art sculpture that will be displayed at Reverse Garbage as the next Pop Up Cycle installation! Opening hours: 10am to 4pm until Sunday 7 April 2013. Please bring item(s) to add to the POP UP CYCLE art installation with you to the gallery.